Alas, the holidays are upon us. ‘Tis time to make merry, revel in cheer and spread joy across all the digital lands of yore. Let us reminisce of the improvements we’ve made to our pay-per-click accounts throughout the year and exalt the future optimizations that the new year will bring. I’ve been a really, really, reeeaaalllyy good PPC analyst this year. So, I surely must have made the big guy’s “Nice” list. 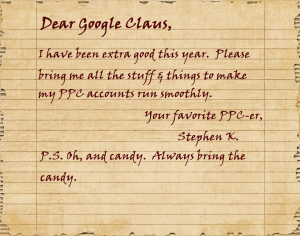 What better time to take a moment to compile my Google AdWords wishlist and e-mail it off to Santa [Clara]? What I really want this year is to spread the joy of PPC to the needy SEMs in the world. Uniformity: Chart options vary depending on which tab you are on. You might not see the same options on the Keywords tab that you see on the Ads tab. Sometimes a column displayed in the report isn’t available as an option in the chart. Sometimes you might not have the option to view a chart at all. Take a look. You’ll see. I ask that there be a more consistent feel across the various available AdWords reports. Segmentation: It would be incredibly useful to quickly see how performance changes between devices, geographic areas, ad position (top vs. other), or any other of the various Google AdWords dimensions worth analyzing. When a segment is selected, I would like to see the chart update along with the data table. “But isn’t this all possible in Excel? ” you might ask. Yes, it is. But exporting and merging countless spreadsheets in order to generate a simple graph can, at times, be time-consuming. The simple effectiveness of the Google AdWords charts is one of my favorite parts of the platform and having a more advanced implementation in place would take the UI to the next level. I simply ask that that Big Googly Elf improve and expand upon the current charts. Think about this one: what if you could geo-targeting specific campaign elements rather than create entirely new campaign to accomplish your desired feat. Let’s say, for example, I want to serve a variety of ads to a multitude of geographic regions. Plus, each of these ads is to contain a very specific offer relevant only to the audience in said specific geographic region. Currently, I can only do this by creating duplicate campaigns then adjusting the geo-targeting settings therein. What I propose is that the capability to geo-target individual ads and ad extensions to specific regions is created, therefore eliminating the need to build multiple “copy-cat” campaigns. This change would help streamline management of very complex accounts while still offering the desired amount of control over who is seeing your AdWords ads. This is simply an analysis issue. I do just as much of my work in Google Analytics as I do in Google AdWords, if not more. It would be incredibly useful to actively integrate more and more GA functionality into the Google AdWords UI. What if I could import more user metrics? What if I could filter keywords based on a regular expression? What if I could apply an advanced segment while viewing reports? There’s a whole lot of “what ifs” in this regard. I can imagine a multitude of additional scenarios. In my opinion the more integrated that Google Analytics and Google Adwords become, the more useful and insightful the platforms will become. My true wish is that the two platforms become one (but that isn’t happening any time in the foreseeable future). Now, this is just a short wishlist. If I have some time before the big day maybe I’ll hit up the man in red (green, blue, and yellow) once again. After all, I don’t want to get too greedy and find myself on Google Claus’ “naughty” list. Then I’d never get the tools I oh-so crave. What are some changes you’d like to see come to the Google Adwords platform in the months ahead? Leave a comment. Happy holidays.